Vaping devices (vapour devices or e-cigarettes) are devices that heat a liquid consisting of a carrying solution and a combination of flavourings and/or nicotine. The resultant vapour is inhaled. There are two categories of vaping devices: those that contain nicotine and those that do not. In Canada, about 9% of Canadians 15 years of age and older, and 20% of youth in the age groups 15-19 and 20-24 respectively, have tried vaping devices.1 Of those who tried vaping devices, 55% reported that the last device they used did not contain nicotine, 26% reported using a nicotine-containing device and 19% were unsure. Vaping devices first entered the North American marketplace in 2007,2 and in 2009 Health Canada issued an advisory against the nicotine-containing product, as insufficient evidence was available to support the safety of the devices.3 The Canadian Public Health Association (CPHA) supported this prohibition. There has been limited enforcement of the advisory, and nicotine-containing products remain available through, for example, e-commerce and storefronts that sell the product illegally. The sale of non-nicotine-containing products was not affected by the advisory. In 2016, the federal government introduced Bill S-5,*An Act to Amend the Tobacco Act and the Non-Smokers' Health Act and to make consequential amendments to other acts. Its purpose is to require plain packaging of tobacco products, and to provide the legislative framework necessary to permit the sale of nicotine-containing vaping devices in Canada. 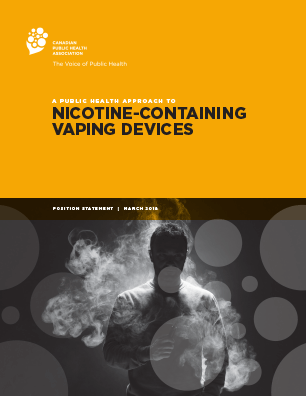 CPHA maintained a watching brief on vaping devices from 2013 until Autumn 2016, at which time the Association recognized that the maturation of the industry and the availability of health and safety information concerning the nicotine-containing products, coupled with the introduction of Bill S-5, merited a statement from a public health perspective. A working group was established to review the available evidence and provide recommendations concerning the sale of nicotine-containing vaping devices in Canada. Subject the products to the provisions of the Food and Drugs Act, should the manufacturer wish to make claims regarding their use as smoking cessation devices. Examine the societal influences that lead youth and adolescents to start using nicotine-containing products, and develop programs to address these issues. Establishing regulations for the display and promotion of vaping devices at places where they are sold. Establish a pricing structure that acts as a deterrent to the purchase of the nicotine-containing products, similar to that used for tobacco products. Restrict advertising related to these nicotine-containing products, similar to the restrictions on the advertising of tobacco products. Vaping devices first entered the Asian marketplace in 2004 and their use spread rapidly. In 2011, the market was estimated at $2 billion (USD)4 and was anticipated to reach $10 billion (USD) by 2017 in the United States alone.5 Most traditional tobacco companies have investments in the vaping device industry. Complicating this rapid growth was a general lack of evidence concerning the health effects and safety of both the nicotine- and non-nicotine-containing products. There were also unsubstantiated claims that the nicotine-containing product could be used as a smoking cessation device, or would prove ‘safer’ than tobacco products, as the user was not being subjected to the complex array of potential carcinogens resulting from tobacco use. The long-term health effects of inhaling the vapour requires further research. It should be noted that research on vaping devices is ongoing and the evidence continues to evolve. The recommendations included in this position statement reflect our current understanding. * Currently at “Committee Reporting the Bill with Amendments” stage, March 20, 2018. 1. Statistics Canada, 2017. Summary of Results for 2015: Canadian Tobacco, Alcohol and Drugs Survey (CTADS). Available at: https://www.canada.ca/en/health-canada/services/canadian-tobacco-alcohol-drugs-survey/2015-summary.html. 2. Orjensen, I. 2013. E-cigarettes are to be regulated as medicines from 2016. British Medical Journal 2013; 346 DOI: http://dx.doi.org/10.1136/bmj.f3859. 3. Health Canada, 2009. Recalls and Alerts: Health Canada Advises Canadians Not to Use Electronic Cigarettes. Healthy Canadians, 27 March 2009. Available at: http://www.healthycanadians.gc.ca/recall-alert-rappel-avis/hc-sc/2009/13373a-eng.php. 4. Euromonitor International, 2012. E-cigarettes: A US$2 billion global industry – who should be worried? 5. Torsoli, A., Kitamura, M. 2013. Future of E-cigarettes in question on European crackdown: Health. Bloomberg Media, 14 June 2013. Available at: http://wshpost.bloomberg.com. 6. O’Leary, R., MacDonald, M., Stockwell, T., & Reist, D. Clearing the Air: A systematic review on the harms and benefits of e-cigarettes and vapour devices. Victoria, BC: Centre for Addictions Research of BC, 2017. 7. Schwartz R, Zawertailo L, Ferrence R, O’Connor S, Selby P, Eissenberg T, et al. RECIG: Research on E-Cigarettes Research Report International Expert Panel. Toronto, ON: Ontario Tobacco Research Unit, 2016. 8. US Food and Drug Administration, 2016. FDA’s New Regulations for E-cigarettes, Cigars and All Other Tobacco Products. Available at: https://www.fda.gov/tobaccoproducts/labeling/rulesregulationsguidance/ucm394909.htm. 9. Medicines and Healthcare Products Regulatory Agency, 2016. E-cigarettes: Regulations for consumer products. Available at: https://www.gov.uk/guidance/vaping device-regulations-for-consumer-products. 10. European Union, 2014. Questions and Answers: New Rules for Tobacco Products. Available at: http://europa.eu/rapid/press-release_MEMO-14-134_en.htm. 11. Parliament of Canada, 2015. Vaping: Toward a Regulatory Framework for E-cigarettes. Committee Report 2015. Available at: http://www.parl.gc.ca/HousePublications/Publication.aspx?DocId=7862816. 12. Government of Canada, 2016. An act to amend the Tobacco Act and the Non-smokers’ Health Act and to make consequential amendments to other Acts. Senate Government Bill S-5. Available at: http://www.parl.gc.ca/LegisInfo/BillDetails.aspx?Language=E&Mode=1&billId=8616151. The rapid rise in popularity of vapour devices has opened debate on their possible harms as well as benefits. Some proponents claim that they can be used as smoking cessation aids, while others claim that the devices can lead to the normalization of smoking and act as a gateway to smoking cigarettes, particularly among youth and adolescents. Vapour devices rose in popularity at a rate that outpaced the research; as such, there were gaps in the knowledge regarding potential harms and benefits, as well as a lack of standardization in their production and that of liquids available for use. These gaps in knowledge have led to confusion among the public about the safety of vaping and the potential dangers of second-hand vapour, as well as uncertainty among legislators regarding how vaping devices should be regulated. Both projects conclude that further research is needed in the areas of long-term health effects and use as a cessation aid, and that regulation should limit uptake by youth while acknowledging the potential use of vaping devices in harm reduction and cessation programs. These results are presented in Table 1 and are discussed below. The Clearing the Air study included evidence published up to April 2016 and the OTRU study included evidence published up to August 2015. Cessation No consistent evidence that using a vaping device influences a dual user regarding cigarette use. Insufficient high-quality studies to know for certain the effectiveness of vaping devices as a cessation aid. Transition to tobacco Vapour device use does not lead to tobacco use among youth. There is insufficient evidence to suggest that use of vaping devices is a catalyst for smoking. The studies disagree on whether there is sufficient evidence to make a statement on whether vaping devices lead to tobacco use. Health effects Vaping produces lower levels of carcinogens; however, no independent research has focused on emissions of 1,3-butadiene. The type of device and how it is used results in differences in emissions. Nicotine, PM2.5 and toxicant yield suggest there are potential health effects. For current smokers, switching to vaping devices will decrease the risk of tobacco-related disease, but long-term health effects are unknown. Clearing the Air study includes information on physiological differences between smokers and vapers. OTRU study includes data on perceived health risk. Second-hand vapour Vapour-produced absorption of nicotine in bystanders; conflicting findings on emissions of particulate matter, polycyclic aromatic hydrocarbons, and metals. Nicotine, PM2.5 and other compounds are released into the environment; long-term health effects of passive exposure are unclear. Clearing the Air study includes information on physiological responses to second-hand e-cigarette vapour and particulate matter. Patterns of use Few youth have established a regular pattern of consumption that could serve as the behavioural basis for regular tobacco use. There is an increased acceptability and use of vaping devices among youth and adults. OTRU study contains greater detail on device use, nicotine use, and co-use. The Clearing the Air research concluded that there was no support for the belief that using vaping devices would lead youth and adolescents to begin smoking tobacco,1 while the OTRU study indicates that there is insufficient evidence to determine whether vaping devices can be considered a gateway to tobacco.2 In the majority of cases, it is smoking tobacco that leads to e-cigarette use. A critique of studies that claim a relationship between vaping devices and tobacco uptake by youth is that they use “ever-use” or “past-30-day-use” as a measure for e-cigarette use, and that this should not be considered a measure of “regular” or “current” use.1 A measure of “past-30-day-users” will overestimate the number of “regular” or “current” users, as it will include those who may have tried once or twice but did not continue. Research examining the link between e-cigarette use and smoking tobacco cigarettes should consider “regular” users of vaping devices. A literature scan was performed to determine whether there was any new information regarding the issues identified in the Clearing the Air and OTRU studies. The results are outlined below. Since the completion of the Clearing the Air report, there continue to be conflicting studies published on vaping devices as smoking cessation aids. Studies published later than April 2016 have demonstrated a negative association between vaping devices and cessation;3 other studies report no association.4 This is in contrast to studies that demonstrated that among dual users, vaping devices maintain smoking reduction, lessen withdrawal5 and are associated with a higher rate of quitting over the long term.6 A systematic review that analyzed RCTs and cohort studies determined that, while there is a reduction of tobacco cigarette use among regular e-cigarette users, there was not sufficient evidence for conclusive results about the effectiveness of vaping devices.7 Most individuals who begin using vaping devices do so in an attempt to quit smoking,1,2 which makes it unclear whether vaping devices would be any more effective than other NRT methods. While the evidence supports the effectiveness of vaping devices as a cessation aid, success has been demonstrated only among those who want to quit. The studies on the effectiveness of vaping devices as a cessation aid tend to compare cessation rates of those who use vaping devices to rates of those who do not; therefore there continues to be a need for research comparing the effectiveness of vaping devices to other established NRT methods. There continues to be uncertainty around the extent of the health effects of vaping devices. Much of this uncertainty is due to the wide range of available devices and liquids. While decreased levels of volatile organic compounds and carbon monoxide have been observed in individuals who switched from tobacco to a vaping device,12 the level of toxicants released can depend on the device used, the type of liquid used, and how the device is used.1 The lack of standardization makes it difficult to assess the potential health risks. For example, recent studies have shown that among 27 different vaping products, nicotine levels were found to vary from a yield of less than one to more than three combustible cigarettes,13 making it difficult to generalize findings. Furthermore, under certain conditions, the addition of sweeteners to e-liquids has been found to result in furfural (a toxic furan) levels comparable to those found in traditional tobacco cigarettes.14 Besides the variation caused by the type of device or the liquid used, further variation in the toxicants released can be caused by altering the voltage, and the age of the device can be a factor.15 The vast number of devices and liquids available, and lack of standardization in manufacturing, render it difficult to definitively assess the potential health risks, making the long-term health effects of vaping devices another area requiring further study. Both the Clearing the Air and the OTRU studies briefly mention the potential of vaping devices as a harm reduction tool, but neither included the topic in the research questions covered. While the potential exists for vaping devices to be used in tobacco harm reduction, as they contain significantly fewer toxicants, questions remain about the ethics of their use. The ethical considerations have been reviewed and are related to the issues outlined above, including product safety, efficacy for smoking cessation, use among non-smokers, and use among youth.16 One concern is that uptake by non-smokers could lead to increased net public health harm due to nicotine addiction. This concern is countered by limiting the sale of nicotine-containing liquids (which are prohibited in Canada) to those individuals using vaping devices as part of physician-prescribed NRT. Further research into the issues outlined in the Clearing the Air and OTRU studies will shed light on the potential use of vaping devices in harm reduction strategies. 1. O’Leary, R., MacDonald, M., Stockwell, T., & Reist, D. Clearing the Air: A systematic review on the harms and benefits of e-cigarettes and vapour devices. Victoria, BC: Centre for Addictions Research of BC, 2017. 2. Schwartz R, Zawertailo L, Ferrence R, O’Connor S, Selby P, Eissenberg T, et al. RECIG: Research on E-Cigarettes Research Report International Expert Panel. Toronto, ON: Ontario Tobacco Research Unit, 2016. 3. Ekanem US, Cardenas VM, Cen R, Simon W, Chedjieu IP, Woodward M, et al. Electronic nicotine delivery systems and smoking cessation in Arkansas, 2014. Public Health Reports 2017;21(10) DOI: 10.1177/0033354916689611. 4. Yuyan S, Pierce JP, White M, Vijayaraghavan M, Compton W, Conway K, et al. E-cigarette use and smoking reduction or cessation in the 2010/2011 TUS-CPS longitudinal cohort. BMC Public Health 2016;16(1105) DOI: 10.1186/s12889-016-3770-x. 5. Jorenby DE, Smith SS, Fiore MC, Baker TB. Nicotine levels, withdrawal symptoms, and smoking reduction success in real world use: A comparison of cigarette smokers and dual users of both cigarettes and E-cigarettes. Drug and Alcohol Dependence 2017;170:93-101. 6. Zhuang YL, Cummins SE, Sun JY, Zhu SH. Long-term e-cigarette use and smoking cessation: A longitudinal study with US population. Tob Control 2016;25:i90–i95. 7. Ghosh S, Drummond MB. Electronic cigarettes as a smoking cessation tool: are we there? Curr Opin Pulm Med 2017;23(2):111-116. 8. Zhong J, Cao S, Gong W, Fei F, Wang M. Electronic cigarettes use and intention to cigarette smoking among never-smoking adolescents and young adults: A meta-analysis. Int J Environ Res Public Health 2016;13 DOI: 10.3390/ijerph13050465. 9. King BA, Patel R, Nguyen K, Dube SR. Trends in awareness and use of electronic cigarettes among U.S. adults, 2010–2013. Nicotine Tob Res 2014; DOI: 10.1093/ntr/ntu191. 10. Miech R, Patrick ME, O’Malley PM, Johnston LD. E-cigarette use as a predictor of cigarette smoking: results from a 1-year follow-up of a national sample of 12th grade students. Tob Control 2017; DOI: 10.1136/tobaccocontrol-2016-053291. 11. Leventhal AM, Stone MD, Andrabi N, Barrington-Trimis J, Strong DR, Sussman S, et al. Association of e-cigarette vaping and progression to heavier patterns of cigarette smoking. JAMA 2016;316(18):1918-1920. 12. Pulvers K, Emami AS, Nollen NL, Romero DR, Strong DR, Benowitz NL, et al. Tobacco consumption and toxicant exposure of cigarette smokers using electronic cigarettes. Nicotine Tob Res 2016; DOI: 10.1093/ntr/ntw333. 13. EL-Hellani A, Salman R, El-Hage R, Talih S, Malek N, Baalbaki R, et al. Nicotine and carbonyl emissions from popular electronic cigarette products: correlation to liquid composition and design characteristics. Nicotine Tob Res 2016; DOI: 10.1093/ntr/ntw280. 14. Soussy S, Ahmad EL-Hellani A, Baalbaki R, Salman R, Shihadeh A, Saliba NA. Detection of 5-hydroxymethylfurfural and furfural in the aerosol of electronic cigarettes. Tob Control 2016;25: ii88–ii93. 15. Sleiman M, Logue JM, Montesinos VN, Russell ML, Litter MI, Gundel LA, et al. Emissions from electronic cigarettes: Key parameters affecting the release of harmful chemicals. Env Sci Tech 2016;50:9644-9651. 16. Franck C, Filion CB, Kimmelman J, Grad R, Eisenberg MJ. Ethical considerations of e-cigarette use for tobacco harm reduction. Resp Res 2016; DOI 10.1186/s12931-016-0370-3.